I am Apostle Thomas L. Rodgers, Sr., a 65 year old missionary and visionary. I am a local pastor in the Charlotte area and I am very concerned about my people, here and in Africa. For some years now I have been involved with Liberia, West Africa and I now have the opportunity as well as resources to begin a great agriculture project there. 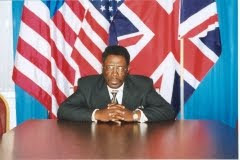 I have been given access to over 250,000 acres of land in Africa. I have acquired machinery and farming equipment to help cultivate that land for one of the greatest agriculture development ever. With this equipment we can implement a vast farming industry in Liberia and other parts of Africa. This will not only feed millions of people, but create jobs for them to sustain themselves for much longer than a bowl of soup. We hope to not only farm this land, but provide adequate housing, hospitals, and schools for thousands of refugees that have been displaced due to dire circumstances. In my closing, I hope to Unite Africans and African Americans in a joint effort to restore a homeland. Apostle Thomas L. Rodgers, Sr. Copyright dawghousewebdesigns.com All Rights Reserved. Our Mission is to help alleviate world hunger by utilizing the vast wealth of resources found in the continent of Africa. The soil is some of the richest in the world. The climate is conductive to year around harvesting of crops and labor source is endless. By doing so, we hope to create industries that will provide jobs for those seeking an alternative to the poverty and harsh treatment that we now face.We will use an international joint effort to re-establish Africa as the "cradle of civilization". We intend to apply the same concepts and industrial tatics used to create America and apply it to the reconstruction of Africa. We are a non-profit organization with a 501 (c)3 status and any donations would be greatly appreciated and is consiidered as tax deducible. is organization was developed to bring aid to war-torn Liberia, West Africa during and after the civil uprising that resulted in the displacement and death of many Liberians. Several shipments of relief items have been sent to Liberia, and 40 churches have come together under the leadership of Apostle Thomas L. Rodgers, Sr., to not only learn and spread the gospel of Jesus Christ, but to facilitate the aid distribution under Unison-Liberia. Unison-Liberia made available to many displaced citizens of Liberia a compound facility to be used for housing. The efforts of Unison-Liberia still continue today. African Americans of various backgrounds have long desired to return to their native homeland with hopes of helping in the construction of technological advances for that great continent. Through Unison-Liberia, African Americans and Africans are seeking to enter into cooperative relationships with each other. Combined efforts would put both nationalities in the position to build interstate highways throughout Africia, embark on large scale commercial farming projects, enhance the airline industry, shipping and banking industries, invest in business of rock quarrying, develop electrical and water systems, solar, nuclear, and windmill energy systems, and so much more. Africa has the potential to become the greatest agriculture exporter in the world. This is the most ignorant man in america. He even talk stupid. And to endorse donald trump is just ignorant, it shows this man is guessing. Who follows a man like this. Wow, just wow. Well he doesn't speak for me nor can he sway my vote.